Home / Blogging 101 / Blogging 101--> How to schedule your posts to go live at a specific date and time? Blogging 101--> How to schedule your posts to go live at a specific date and time? 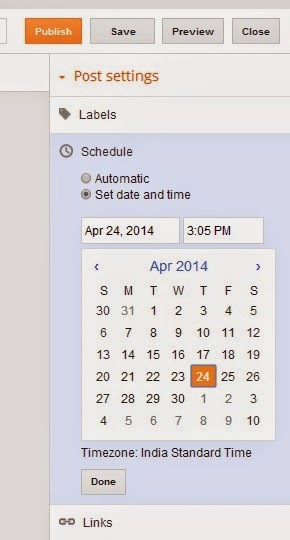 Step 2: Click "Schedule" on the right side panel of the window and select "Set date and time". 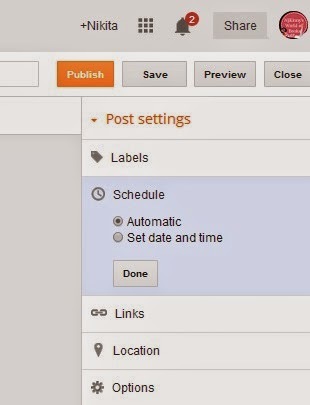 Step 3: Enter the time and date you want the post to be published on. Click "Done". Step 4: Click "Publish". Don't worry. The post will go live only on the date and time you have selected.